Why is it called a Tennis Bracelet? My friends and I were watching the grand finale of The Real Housewives of Orange County tonight, and a question popped into my mind. One of the cast members, Tamra, received a “tennis bracelet” for her birthday. 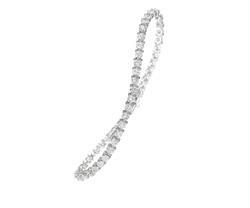 The tennis bracelet is an in-line thin diamond bracelet that features a symmetrical pattern of diamonds. It’s a beautiful piece of jewelry, yet the name is so startling. I wondered, “Why is it called a tennis bracelet?” A little research revealed a possible answer. According to Diamond Bug, in 1987, Chris Evert, the former World No. 1 woman tennis player and the winner of 18 Grand Slam singles titles, was playing in the U.S. Open. She was wearing an elegant in-line diamond bracelet, made by jeweler to the stars George Bedewi. Unfortunately, the bracelet broke during a match and interrupted the game so that Evert could recover her precious diamonds. The “tennis bracelet” incident made history and inspired a new name for the jewelry item.